Naomi Parks has been a freelancing professional since 2004. She is a biochemist and professional medical writer with areas of interest in pulmonology, pharmaceuticals, communicable diseases, green living and animals. She received her Bachelor of Arts in biological anthropology from San Francisco University and her Master of Science in biochemistry from Pace University. Bloating is a minor gastrointestinal condition in which the abdominal area feels uncomfortably full and tight, which may even manifest visibly. Bloating can have several potential causes that don't relate to specific foods, such as constipation, compulsive air swallowing, general weight gain and bacterial overgrowth in the bowels. Nonetheless, some foods have characteristics conducive to causing bloating. Ham can be one such food, depending on its preparation. All ham contains sodium, but some ham specifically undergoes a salt curing process called dry curing as part of its preparation, dramatically increasing its sodium content. The process includes aging, which can take up to a year. Dry-cured ham usually appears in stores fully cooked and often sliced for use in sandwiches or finger foods. Different types include prosciutto, country hams and fresh ham. 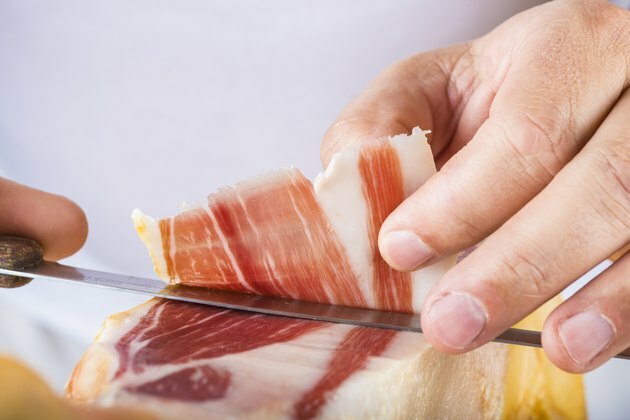 The USDA indicates that some dry-cured ham labels suggest further preparation of the product -- such as soaking it in water before you eat it --and adherence to these suggestions is the only way to maintain safety in such products. Sodium can cause bloating indirectly due to water retention. When you consume excess sodium, the body stops excreting excess water to dilute it. This water retention can cause discomfort and a feeling of fullness or swelling throughout the body associated with bloating. Ham is most frequently wet-cured, according to the USDA. To wet cure a ham, you inject it with a water-based brine that could include salt, sugar, sodium erythorbate, sodium phosphate, sodium nitrate, sodium nitrite, sodium chloride and flavorings like spices or liquid smoke. In addition to the salt that can cause water retention, the sugar in these brines may cause gas. In fact, carbohydrates are the majority of what causes gas, while fats and proteins produce little gas. Gas often causes feelings of bloating, but bloating is even more likely when the gas effect from sugar combines with the water retention that results from salt. Ham is often high in fat and cholesterol. In addition to properties it may contain during its preparation, the lipids in ham slow digestion, causing a sustained feeling of fullness. Moreover, it prevents the normal passage of gasses through the digestive system, resulting in feelings associated with bloating. Although many characteristics of ham make it more likely you will develop bloating from eating it, every digestive tract is different. Therefore, only some ham may cause bloating, or ham may have no affect on you. On the other hand, if you experience bloating after eating ham, it's likely due to the fat, sodium and sugar content of the meal. However, some instances of bloating may be due to a serious condition. Ascites, celiac disease, ovarian cancer, dumping syndrome and pancreatic insufficiency are examples of serious and potentially life-threatening conditions that can cause bloating. Visit a doctor if you experience bloating frequently, particularly if its accompanies with abdominal pain, diarrhea, bloody stools, progressively worsening heartburn, dark or tarry stools, inordinate weight loss or vomiting.